Introducing Autopart International’s OEF³. Our 100% NEW starters & alternators are built with premium components and are 100% computerized load tested prior to shipment. They are manufactured to meet or exceed OEM units in fit, form and function. Our OEF³ gives Professional Service Providers higher confidence in new as compared to remanufactured. We support 1,000 unique SKUs and they offer a lifetime warranty for professional installer’s peace of mind. Read on to find out more information on when starters and alternators need replacement. 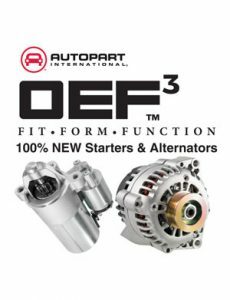 To learn more about this product line contact your local Autopart International store today.